Walmart (WMT) shares may be closing in on new highs after posting quarterly results on Thursday, but this may also be a good time for investors to head for the register and cash out. The world's largest retailer's report wasn't all that impressive. Net sales rose just 1.6 percent to $114.9 billion. Despite a 20 percent increase in global online sales and Walmart's seemingly open-ended growth potential overseas, this is a company that is struggling just to keep pace with inflation. The news gets worse once you look at the U.S. Walmart stores where same-store sales actually declined 0.3 percent during the period. The shocker is that this isn't the first time that your average Walmart location has failed to live up to its prior year's tally. They've reported negative comps more often than positive periods over the past four years. The notion that Walmart is an all-weather retailer -- capable of ringing up sales in good times when folks have money to spend and in bad times as affluent shoppers trade down to Walmart -- just isn't holding up in light of the chain's recent years of financial performances. Walmart isn't only for low-income families. The chain claims that 60 percent of the country buys something at Walmart in any given month. You'll find plenty of middle-class and even upper-crust shoppers there getting more bang for their bucks. However, head out to a Walmart parking lot at midnight at the start of the month and you'll see plenty of low-income families with the government benefits cards that get reloaded monthly with food stamps or nutritional grant aid for young mothers. Fair or not, Walmart gets lumped in with dollar stores and other deep discounters. It has never managed to pull off what its nearest rival Target (TGT) has done with its "cheap chic" appeal. It's cool to be seen at Target. You won't find too many people posting Facebook status updates about heading out to Walmart. One would think that it should be Walmart -- and not Target -- donning the bullseye logo at the front of its stores, given that it's such a common target for protestors. Why isn't Walmart paying enough? Where are the employee benefits? Is working at Walmart a dead-end job? %VIRTUAL-article-sponsoredlinks%It points out that its wages are at or above the retail industry average, and that 75 percent of its store managers -- earning between $50,000 and $170,000 a year -- started out as hourly associates. 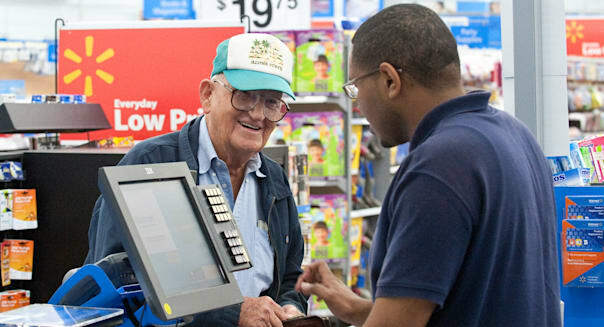 Walmart also points out that benefits for qualifying associates include a 401(k) plan with a company match, education assistance, merchandise discounts, and health care with plans starting at $40 a month. The stores also pay out performance bonuses -- even to part-time workers -- that totaled $770 million to hourly associates last year. Naturally you will find labor groups and mom-and-pop retailers arguing otherwise, but Walmart has grown to become the world's largest retailer by saving consumers as much money as possible on everyday purchases. However, its not unreasonable to think all of the negative sentiment is weighing on Walmart if its typical U.S. store is selling less than it did a year earlier. The showrooming trend that has disrupted consumer electronics chains is starting to work its way to traditional retailers. As cheap as Walmart can be given its size, buying advantages, and low markups, it may not be able to compete with Amazon.com (AMZN) and other e-tailers that don't have to pay for a local presence. Walmart may have bragged on Thursday about its 20 percent spike in online sales worldwide in its latest quarter, but Amazon's growing even faster. Walmart is beefing up its e-commerce efforts, and that even includes testing grocery deliveries in Denver. Well, Amazon's all over that, too, recently expanding AmazonFresh beyond its Seattle home base. Things won't get any easier from here. Walmart has been struggling at the store level for years despite being widely recognized for its low prices. Now the changing face of commerce may threaten Walmart's lone advantage over the competition -- and that's before even considering the digital distribution of media that is giving shoppers fewer reasons to stop by Walmart to pick up new CDs, DVDs, or video games. If Walmart is just meandering about now, it's going to be hard to keep moving forward at all in the future. Motley Fool contributor Rick Munarriz has no position in any stocks mentioned. The Motley Fool recommends Amazon.com. The Motley Fool owns shares of Amazon.com. Try any of our newsletter services free for 30 days.